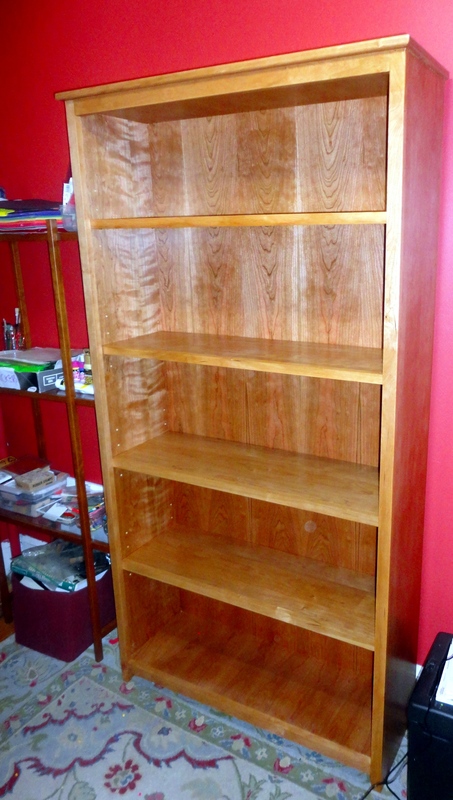 I finished the final two shelves for the bookcase last night. I love the spray finish and spray system. A step that would have taken nearly a week with an oil-based finish can be finished in a couple of hours. When I used a wiping varnish, I had to let the project dry overnight between coats. With the spray finish it takes 15-30 minutes to dry between coats. That means more coats in a single night, and fewer dust particles on the project. The water-based finish also leaves much less of a smell in the house (and no smell on the project after it dries to the touch in 30 minutes). 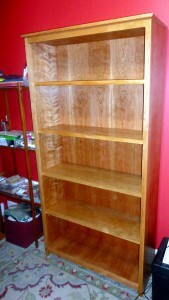 It will be a nice addition to have book storage in the study. I’m okay with how the bookcase turned out. I can see some of the mistakes I made – I probably should fit the shelves after the carcase is constructed and need a proper shelf-hole jig. But overall it feels pretty sturdy and looks not too bad. Last night I bet Will a quarter he couldn’t find two mistakes in 5 minutes on the project. Of course the first mistake he found was one that I hadn’t noticed before – it is good to find another honest critic in the house. No sense in building projects for the house if I don’t try to make myself a better woodworker from each project. 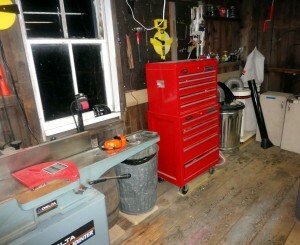 I also have been making some progress on rearranging the workshop. 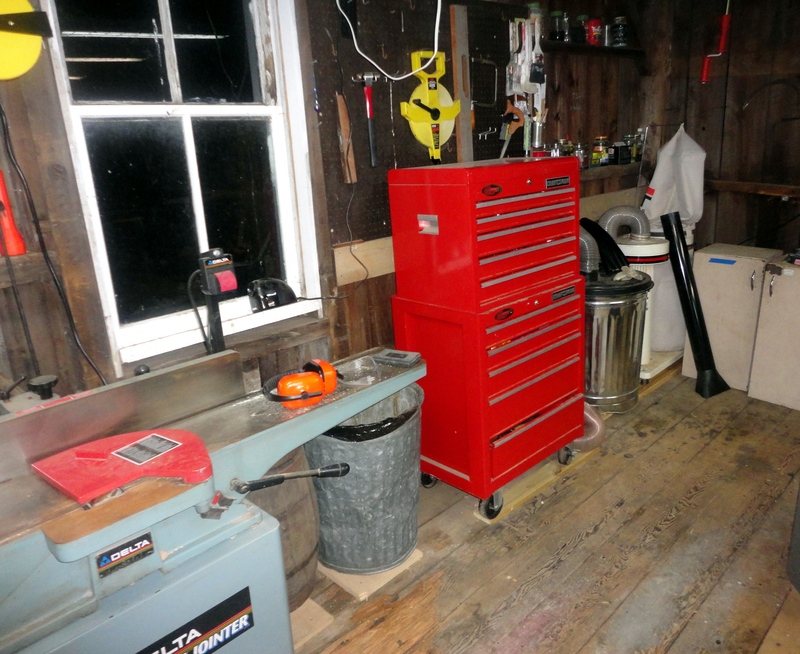 My first attempt to reorganize failed (having the planer between the jointer and table saw made for a much too long walk around the jointer to feed wood into the planer). Today we are planning a chore day. I will get some concrete to pour a footing for an additional support post for the workshop, and then work on making a small patio/step in front of the door to the workshop – I have been using the workshop enough that all the grass is dead – it is now a mud pit. I am using some lumber I have left over and the remaining concrete blocks from the patio. So it is a double bonus. I use up some materials I have sitting around and get a new entrance step to the workshop. Of course I am expecting to get all these projects done and still have time to hand out, maybe paint the new door to the workshop, maybe work on shelves for the workshop. However, I am learning (yes, it does take a long time to learn) and am only planning the two outside projects for today. Anything else will be a bonus.